Did you know you have more sweat glands in your intimate area than in your underarms? Thr right intimate hygiene is essential for a happy, healthy intimate infection-free life. But we women prefer ignoring the symptoms of vaginal infection. What makes it worse is the awkwardness of the situation, shyness to raise the issue, tolerance of irritation and silent suffering. Not anymore. C&D Intimate Cream is the No.1 product in the Clean and Dry range - trusted by over 5.5 million women across India. Its handpicked natural ingredients soothe the vaginal area and keeps it safe from infections and its symptoms like rashes, burning, odour, white discharge and other symptoms of vaginitis. It also cleans, soothes and protects your extra sensitive vaginal skin. It helps eliminate odour. Millions of women across India have made Clean and Dry wash a part of their daily hygiene ritual. After all, today’s stress filled life with improper hygiene in public washrooms and increasingly extreme topical climate results in various vaginal infections. In fact there could be hundreds of reasons for your vaginal discomfort from tight clothes, the foods you eat, synthetic undergarments, sexual activity and even the most simple yet obvious reason, soap and water to clean the vaginal area! The pH Balance of most soaps is very high in the 7.5 to 8.5 zone. While the pH of your intimate area is very low in the 3.5 to 4.5 category. The regular use of soap to clean your vaginal area can cause damage to your body’s ability to protect you from vaginal infection. Resulting in infections! Read more about Clean and Dry Daily Cream and how to heal infections in just 5 days! While having a bath all you need to do is avoid ordinary soap to wash the intimate area, just switch to Clean and Dry Daily Intimate Wash. It just takes 2 minutes but provides you with all day intimate comfort and protection. It helps protect from vaginitis and other symptoms of fungal infections. Clean and Dry wash also removes unnecessary dark pigments that have settled on the intimate skin and brightens it for a fresh, healthy look. WHAT’S IN MY C&D WASH? It contains essential goodness like Aloe Vera and other safe and gentle ingredients that cleans, refreshes, protects. WHEN DO I USE C&D WASH? Clean And Dry Intimate wash is FDA approved. It is pH balanced and has natural Aloe gel extracts to protect, cleanse and brighten your vaginal area. It keeps away itching, irritation and other infections, so you feel fresh and confident all day. 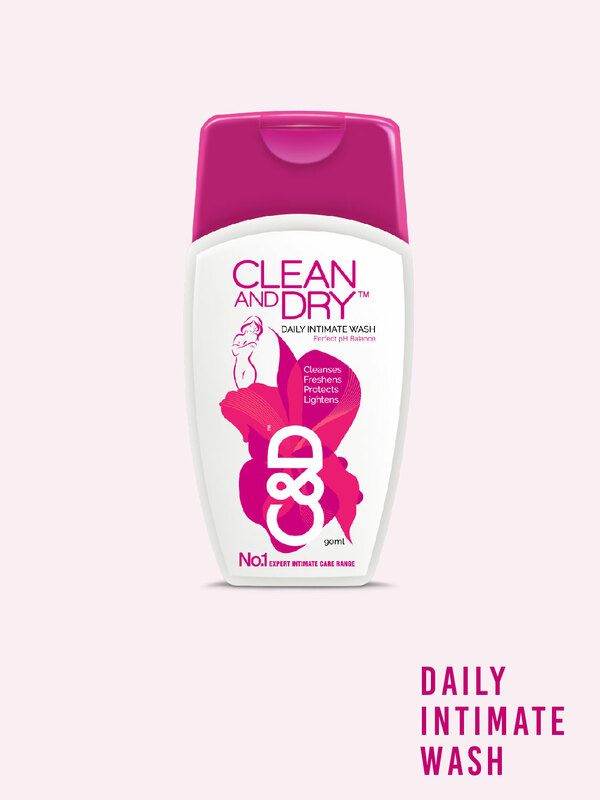 I really like the Clean and Dry Daily Intimate Wash because it absorbs wetness & controls bad odour. Gives you all day freshness. Keeping you clean, happy & protected. I highly recommend Clean and Dry Daily Intimate Wash to every woman. #CleanAndDryIntimateWash is WOMEN’s PRIDE. It is a life savior for every girl especially when she is feeling uncomfortable due to itching in private part & cannot share the reason of this discomfort with anyone. It’s truly the best product for every girl so far. I don’t have any words to review this awesome product. #CleanAndDryIntimateWash is the one product which has helped me to maintain my hygiene level. Its (fragrance) is just perfect and the most important part is it is harmless to my skin & body. #IntimateCareRange #IntimateCare #FeminineCare #WomenCare It keeps the area soft with no rashes . It keeps the area clean & dirt free. Registered now and get free samples of xyz product. Hurry up!! !